Apples of Gold Jewelry offers a beautiful and authentic green amethyst gemstone in this stunning pear-shape green amethyst pendant in silver. The smoky, pale green color of the green amethyst stone pairs well with .925 sterling silver, and has a bit of a vintage feel to it, with the braid going around the sides of the teardrop shape, and the detailed prongs that are hugging the 9mm by 7mm gemstone. The heart shaped prongs add extra personality to the beautiful pendant, which measures 3/4 inch by 1/3 inch. 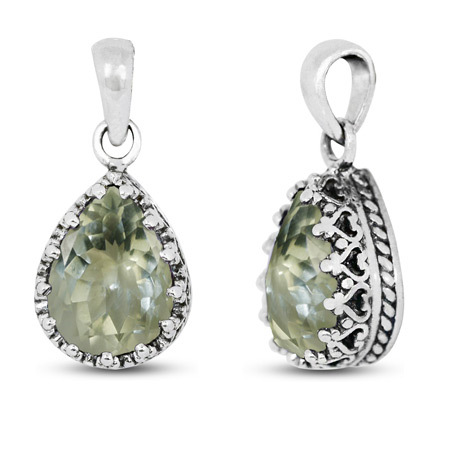 We guarantee our Pear-Shape Green Amethyst Pendant in Silver to be high quality, authentic jewelry, as described above.